Pearl White was born March 4, 1889, in Greenridge, Mo. She began her acting career with the Diemer Stock Company in Greenridge and toured through the Midwest. She married actor Victor Sutherland in 1907, but they were divorced in 1914. While doing stock work in Connecticut, she began making films with the Powers Stock Company in 1910. In 1911, she joined the Lubin Film Company in Philadelphia. She was fired from Lubin, then went to Pathé for a short time followed by the Crystal Film Company in New York. She stayed busy at Crystal, m developing a loyal fan following, until going back to Pathé in 1914. There she made the famous "Perils of Pauline," a 20-chapter serial that ran from March until December. This established her as the queen of serials and a major star. Unfortunately, she injured her back making the serial when co-star Paul Panzer was carrying her up some stairs and fell over backward. The injury was to plague her for many years to come, and many believe contributed to her early death. She made three more serials in 1915, all as "Elaine," rather than "Pearl" ­ "The Exploits of Elaine," "The New Exploits of Elaine," and "The Romance of Elaine." 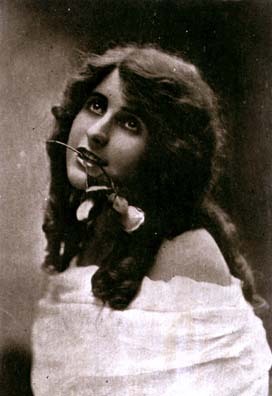 Pathé continued to star her in serials, and she made six more between 1916 and 1920. In 1919, she married actor and dancer Walter McCutcheon, but they divorced in 1921. Tiring of serials, she signed with Fox in 1920 and made nine films for them between 1920 and 1922, none very memorable. She made one more serial, "Plunder," for Pathé in 1923. She left for Europe after this and starred in one French-made film, "Terror" (released in the U.S. as ""The Perils of Paris") in 1924. Although this ended her film career, she did continue acting on the stage in France and England. She also purchased the Hotel de Paris in Biarritz, which she ran for several years, and a nightclub in Paris. She also invested in racing horses and trust funds and remained a wealthy woman throughout the Depression. She married Greek millionaire Theodore Cossika and spent many years traveling around the world and back and forth between their homes in France and Egypt. As her old back injury continued to plague her, she took to alcohol and drugs to relieve the pain. She died at the American Hospital in Paris Aug. 4, 1938.